Mastodon‘s fans have eagerly waited for this album, as it would point out the musical course of the band in a way. I think they should not be disappointed from the result. ‘Emperor Of Sand‘ has the known Mastodon “print” and, additionally more passion and investment both in lyrics and composition. That is, unfortunately, due to the personal tragedies of the band’s members. Troy Sanders’s (bass, vocals) wife was diagnosed with breast cancer, Brann Dailor’s (drums, vocals) mother endured chemotherapy, and Bill Kelliher’s (guitars, vocals) mother passed away from brain tumor. 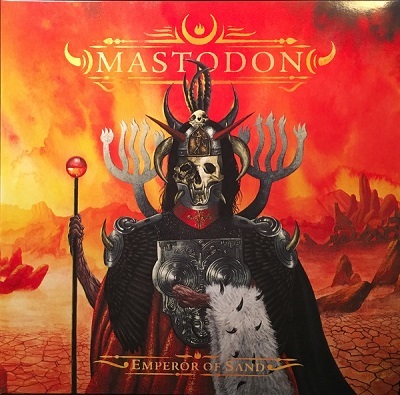 ‘Emperor Οf Sand‘ is a concept album, and like ‘Crack The Skye‘ which was also based on a family tragedy of Brann Dailor, was produced by Brendan O’ Brien. The drummer stated about the concept: “A Sultan in the desert hands down a death sentence to this guy. He’s running from that. He gets lost, and the sun is zapping all of his energy akin to radiation. So. he’s trying to telepathically communicate with these African and Native American tribes to get rain to pour down and kill it.” The album opens with the powerful ‘Sultan’s Curse‘ which, as a title and knowing the story behind can be taken as a metaphor of the curse of cancer. I won’t go through each track and write down how the story goes. Works like this, which are based on personal stories and tragedies, can only be subjectively interpreted. What I received listening to this album, is the hero’s agony. Each track succeeds another in a desultory way achieving perhaps the band’s goal to lead us through a painful experience. Technically, the tracks vary between mainstream rock and progressive metal, leaving the vocals to be the perfect feature for the whole album. There are excellent songs which stand out, like ‘Sultan’s Curse‘, ‘Steambreather‘, ‘Clandestiny‘, and the dynamite ‘Scorpion Breath‘ in which Neurosis‘ Scott Kelly participates taking over vocal duties. The album closes with ‘Jaguar God‘ which opens with a calm -kind of ballad- way to evolve in a sludge metal track. I’ve read the lyrics twice, and I am not sure if the end for the hero of the story was cathartic. Maybe it’s up to each one of us to decide. For sure, this album is really good and proves that Mastodon is a great band which has a lot (more) to offer.